More limited edition collector fragrance bottles, with the usual disclaimers: in most of these cases, the juice is unchanged, just the bottle is “special” (or not, as the case may be), and some of these may not be available in the US. Today’s post includes collector items from Gwen Stefani’s Harajuku Lovers, Comme des Garçons + Pharrell Williams, ERH1012 and Yves Saint Laurent; plus new packaging for Rochas. First, a quick video for the new Pharrell Williams Girl fragrance. Below the jump, a “custom, interactive installation at the Westfield Mall in Stratford, London” for the Girl album (the song is Marilyn Monroe). 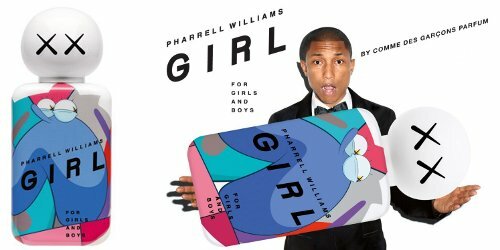 Regular readers can probably already guess that I was barely aware of Pharrell Williams’ existence before he announced his debut fragrance with Comme des Garçons, Girl — he’s not the first celebrity that entered my radar via perfume, and he won’t be the last. In the interest of research, I did listen to a couple of songs while writing this review (Happy got stuck in my head for several hours, thank you) but other than that, I still know little enough. He’s won some Grammys, and everyone but me knows who he is.